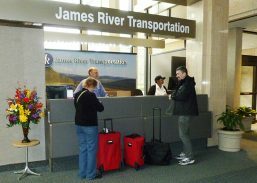 James River Transportation, is the official on-site car service at the Norfolk International Airport. We offer a “Business Class” Sedan Service for our clients. No classes are scheduled at this time, contact us for more information. James River Transportation invites YOU to become a part of our award winning team. Since 1928 we have been providing exceptional customer service to the community with an outstanding team of employees. James River Airport Driver average $12.00 – $14.00 an hour! James River Transportation provides performance bonuses, health insurance, disability insurance, 401k, Paid Annual Leave (vacation, sick pay) and safety incentives. FULL AND PART TIME POSITIONS AVAILABLE – Senior Adults and Veterans are highly encouraged to apply. To be a part of the very best, start your application, complete all sections. We look forward to welcoming you as a new team member. James River Transportation is an equal opportunity employer. We will not discriminate and will take affirmative action measures to ensure against discrimination in employment, recruitment, advertisements for employment, compensation, termination, upgrading, promotions, and other conditions of employment against any employee or job applicant on the bases of race, color, gender, national origin, age, religion, creed, disability, veteran’s status, sexual orientation, gender identity or gender expression.